Because social connection is the bedrock of happiness, in the wellness space a massive trend is new co-working, co-living, and social-slash-wellness spaces and clubs focused on building face-to-face communities in our age of digital isolation and remote work – whether co-working giant WeWork or London’s Mortimer House. 2018 will be the watershed backlash year against Big Tech, with more Silicon Valley engineers speaking out – and more scientific evidence coming to light – about the disastrous effects that constant digital and social media connection has on our brains and happiness. We’re at a moment with tech addiction in many ways analogous to where the smoking issue was decades ago: the initial reluctance to believe the negative health impact will be overwhelmed by the evidence. More tech-fighting tech will appear that helps us do the seemingly impossible: set parameters on emails, texts and screen-time. In wellness travel, no WiFi destinations focused on contemplation, community and nature will be the most sought after, while wellness retreats like Six Senses Bhutan are even programming specifically around the pillars of happiness. And if wellness is often a puritanical philosophy (only pain equals gain), explicitly happiness-focused (or joy-for-joy’s sake) approaches will rise. We’ll see more eating for happiness, with menus and diets packed with serotonin-boasting foods, whether tuna, dark chocolate or blueberries. And with evidence mounting that our microbiome plays a crucial role in regulating our emotions, we’ll see more research and approaches that explore the relationship between a healthy gut and happiness, as the ecosystem of bugs in our intestinal tract produce many of the hormones/transmitters that impact our brains, like mood-boosting serotonin. And we’ll see what you could call a new “happy fitness,” one that is less about overly-complex (and overly-expensive) boutique fitness trends-du-jour: that returns people to exercise as childlike play, whether the surge in trampoline fitness classes or exercise that feels like school recess – with everything from dodge ball to monkey bars. We’ll also see a return to simplicity in exercise, more people embracing movement that is as natural as being human, like simple walking and hiking in nature. And yes…more laughter yoga and smile asana. 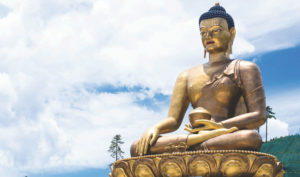 Statue of Buddha in Bhutan, which will test whether the country’s efforts to measure happiness can also work for business. Research on happiness kicked off in earnest back in the 1970s, and one of the foremost contributors was Richard Easterlin at USC, with other leading economists building from his base. Today, the World Happiness Report is authored by three of those leaders: Richard Layard of the London School of Economics; John F. Helliwell of the University of British Columbia; and the well-known economist from Columbia, Jeffrey D. Sachs. And it was the pioneering little nation of Bhutan, which first put happiness (and a Gross National Happiness Index) at the center of government policy, that convinced the UN to make the report an annual publication. Positive emotion — Can only be assessed subjectively. Engagement — The presence of a “flow state,” when a person performing activities is fully immersed in a feeling of energized focus, full involvement, and enjoyment. Relationships — Presence of friends, family, intimacy, or social connection. Meaning — Belonging to and serving something bigger than one’s self. Achievement — Accomplishment pursued even when it brings no positive emotion, meaning, and nothing in the way of positive relationships. Since 2012 the two leading research studies are the World Happiness Report and the Gallup-Sharecare Well-Being Index (now focused on the U.S.), with each measuring slightly different components of happiness. The World Happiness Report revolves around six variables to create an in-depth national happiness score: 1) Income 2) Healthy life expectancy 3) Having someone to count on in times of trouble (social connection/community) 4) Generosity 5) Freedom 6) Trust, or absence of corruption in business and government. The 2017 report found that the Northern European nations of Norway, Denmark, Iceland, Switzerland and Finland (all strong in social support, generosity, physical health and honest governance) ranked as the world’s five happiest nations, while productivity-obsessed economies with fraying social networks, like China and the U.S., fell significantly in happiness in recent years. The Gallup-Sharecare Index tracks these happiness/well-being components: 1) Purpose: liking what you do each day 2) Social: having supportive relationships and love 3) Financial: managing your economic life 4) Community: liking, feeling safe, and having pride, in where you live 5) Physical: having good health and energy to get things done. The latest report also revealed that overall, well-being among U.S. adults dropped substantially in 2017 following a three-year uptick, with emotional and psychological measures the primary reason for the decline. “Research shows we can influence our happiness,” Silvia Garcia, speaking at the 2017 Global Wellness Summit. After decades of happiness science, we now see the wellness industry aligning more tightly with – and creating new approaches and businesses informed by – its key lessons, which include physical wellness among its pillars, but also radically emphasize “purpose” and social connections. Anyone that cares about human health needs to care about happiness, because studies increasingly show that happiness has an independent and powerful impact on physical health. It’s been studied in-depth. For instance, a 2017 meta-review of 150+ studies on the connection confirms with “almost no doubt” that happiness really can influence health. Another Harvard meta-review of 200+ studies found a connection between happiness and optimism and lowered risk of cardiovascular disease and abnormal body weight. A 2018 study led by Cornell University found that people who experience a range of positive daily emotions – from enthusiasm to calm – have lower levels of inflammation, which is linked to a lower risk of premature death and chronic disease. Other studies show happiness’ positive impact on everything from speeding wound healing to longer telomeres. And, while these studies indicate a strong association more than cause and effect, the evidence keeps growing that happiness affects health and aging deep down to the cellular level. Year after year the happiness reports indicate that social connections and a supportive community (whether friends, family, colleagues, etc.) have the most outsized impact on both happiness and health. But experts agree we’re facing a loneliness epidemic. In the UK, for instance, new research shows that more than 9 million people “always or often feel lonely” – while 200,000 senior citizens report they haven’t had a conversation with a friend or relative in more than a month. In the U.S., loneliness rates have more than doubled in the past 40 years, and roughly 43 million adults over 45 suffer chronic loneliness, with one quarter of Americans now living alone. An avalanche of research shows the incredibly negative impact that loneliness and social isolation have on health. 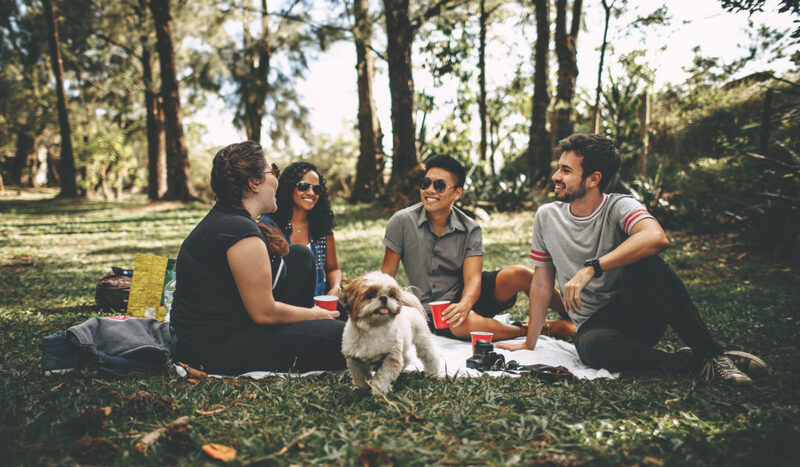 A large recent meta-review of 148 studies found that strong social connection is associated with a 50% reduced risk of early death, while a Brigham Young University meta-review shows that social isolation presents a greater risk of mortality than smoking, excessive alcohol consumption, obesity, and lack of physical activity. And not surprisingly, loneliness affects our brains: a 2016 study found that people who reported loneliness (no matter how many people were actually around them) were 64% more likely to develop dementia. One can cite study after study about the price of loneliness on people’s health (and to society), so while it’s very late coming, governments, the wellness world, and individuals are waking up to the fact that driving more social connection is even more important than curbing obesity. Apple unveiled the harmless looking iPhone one short decade ago and everything suddenly changed. That little screen beckoning us with constant (bad) news, social media updates, and work emails and texts, is always in our pocket or purse or by our beds. And every one of us knows the physical and emotional pull…the addiction. Suddenly, according to research, we’re touching, swiping or tapping our smartphones 2,617 times on average each day, or 1 million times a year! Tristan Harris, a former Google design ethicist, has noted that this compulsion isn’t simply an addiction, it also causes incredible anxiety because we’re “self-interrupting ourselves about every 40 seconds.” And constant digital connection, resulting in a new disconnection from real people, is taking a toll on people’s happiness – and is associated with a big uptick in depression, suicide and extreme body issues. Study after study shows an association between too much screen time and higher rates of depression and anxiety – with much research focused on younger generations. New research shows that seeing picture-perfect images on social media has a negative effect on young women’s self-esteem, and the U.S. Centers for Disease Control and Prevention has found that suicide rates doubled among girls and rose by more than 30% among teen boys and young men between 2007 and 2015 (precisely the smartphone era). A NHS study (2016) out of the UK revealed that a shocking 28% of young women aged 16-24 (the selfie generation) now have a diagnosed mental health condition like anxiety, depression, panic disorder or OCD – while PTSD has tripled (to 13%) from 2007 to 2014. A 2017 Education Policy Institute study revealed that 12% of kids that don’t spend time on social media on a school day have symptoms of mental illness, but that jumps to 27% for those spend more than three hours a day on social sites. A 2018 University of Michigan study reported that teens’ happiness and self-esteem, overall, has plummeted since 2012, and it takes an ever-deeper dive the more hours a week they spend glued to screens. Recent research even suggests that the mere presence of your smartphone reduces your cognitive capacity. Robert Lustig’s new book, The Hacking of the American Mind, argues that the problem is that technology is all about “digital nudging” and addiction to short-term reward (like obsessively checking your Instagram likes) – which delivers pleasure just like substance abuse does: higher and higher doses are needed to maintain the pleasure, and this breed of pleasure is really the opposite of happiness (which is contentment, not constant reward). It makes us miserable. While the early years of the Internet and smartphones were one of heady euphoria (all this tech/info will make us smarter, more efficient), now a tech and social media backlash is brewing, which will ramp up in 2018. Silicon Valley is speaking out on how they design the online experience for addiction: former Facebook employees Sean Parker and Chamath Palihapitiya have come clean about the addictive qualities of social media. Tristan Harris recently surprised Silicon Valley by saying that “(Technology is) an existential threat to the human race,” and his explanations of how Apple, Facebook, Google, Twitter and Snapchat manipulate our attention to keep us hooked on our screens (for as long and as often as possible) has gone viral. The tech backlash has also been stoked by the Russian interference in the U.S. election (and the ugliness, hatred and lies that spawn uncontrollably at social sites) – along with a dawning realization that companies like Google (how people get info), Amazon (how they shop), Facebook (how they communicate with their friends) have a near monopoly on too many aspects of human life. 2018 will be a tipping point: People will realize they have to unplug more. And a desperate need to disconnect from technology and reclaim our sanity will become one of the most important aspects of the future wellness movement, who will sharpen their focus on helping people cut the cord. It’s not that the wellness industry will be a Luddite rejecter of technology – for instance, they will embrace neuroscience to better understand the mechanisms of happiness, hope, empathy, resilience and joy. But they will need to focus on helping people tackle toxic tech addiction. Mo Gawdat, former Chief Business O cer for Google [X] and the author of “Solve for Happy: Engineering Your Path to Joy,” shared his equation for happiness with delegates at the 2017 Global Wellness Summit. Governments are studying the happiness science and recognizing that happier people are healthier and more productive citizens…so are stepping up their happiness policies. Bhutan was the first to put happiness at the heart of government and, according to The Economist, the country has focused on a development policy inspired by the concept of Gross National Happiness (GNH) – which measures things like psychological well-being, health, education, culture, ecology, and community vitality – for more than six decades. The United Arab Emirates has recently appointed a Minister of Happiness and has made happiness a wide-ranging policy priority across many sectors of government, with a long-term plan to make Dubai a world example as to what a “smart, happy” city can be. They even have a “Happiness Patrol” that hands out gift cards to law-abiding drivers rather than tickets. And the UAE’s Prime Minister launched the World Happiness Council in 2017 (to coincide with World Happiness Day on March 20) to help governments promote happiness and improve living standards in their nations. Ecuador has created a minister of happiness (or “buen vivir” – good living); Venezuela named a vice ministry of Supreme Social Happiness; and Wales has their innovative Future Generations commissioner. Both New Zealand and Andhra Pradesh have embraced happiness/well-being as the official goal of government. In South Australia the “State of Wellbeing” policy agenda underwrites the delivery of psychosocial policy interventions and research for the whole country. The UK government with its What Works Network, whose mandate is to improve the well-being of its people each and every year, is getting serious about happiness programs in communities and schools, and about adult mental health (with such fast-growing rates of depression and anxiety). And the country recently named the world’s first Minister of Loneliness, who is tasked with creating a national strategy to reduce social isolation for every age group in the country. Ahead-of-the-curve Bhutan is now taking a bold step by applying its pioneering Gross National Happiness (GNH) development policies to the world of work and business. In 2018, Bhutan is asking companies in the country to use a Gross National Happiness Certification Tool, with employees surveyed on job satisfaction, stress levels, work engagement, workplace discrimination, and emotional experiences. Only those companies that contribute to the happiness of their workers, community, customers, and environment will be granted the certification. The Economist notes that, “The adoption of GNH by the private sector will have a greater impact than public policy…As the average employed person spends…35% of his or her waking day at work. The reality is that (happiness in) businesses and society are interdependent.” And this is why firms globally are just starting to ask the question: Do we need a director of happiness? All this government action clearly illustrates how happiness has evolved far beyond a soft concept. One notable laggard: the U.S., which wrote the “pursuit of happiness” into its Declaration of Independence in 1776, but is doing so little with happiness policy now. With the alarming rise in depression and anxiety among grade school and college-aged kids (1 in 4 American children have an anxiety disorder), the surge in school violence, and increasingly pressure-packed curricula narrowly focused on grades and test scores, more schools are now teaching happiness. And the lesson plans are directly derived from the happiness science: teaching skills around human connection, mindfulness, having a positive outlook, purpose, generosity and gratitude. This April, the city of Delhi, India will roll out daily “happiness” classes for students at all public schools from nursery school through 8th grade. A new school being built in rural Chennai, India shows the amazing innovation underway: this school will have no classrooms, no preparing for standardized tests, because learning to be happy and empathetic will take precedence over traditional learning. Its founder was specifically inspired by the 80-year-long Harvard study that found that strong relationships are key to having happy, successful lives – so the school is designed on the model of a traditional Indian village, and kids will work in spaces like tree-filled meditation rooms, idea labs and test kitchens. California-based non-profit Project Happiness has been creating happiness curricula for students of all ages since 2009, now used in over 120 countries. And a new high school program grounded in their strategies called the Happiness Clubs just launched at several U.S. schools, with its new Life’s Good: Experience Happiness platform having the goal of teaching 5.5 million students happiness skills over the next five years. When schools offer happiness classes the demand is often overwhelming. For instance, the response to Yale University’s new class on happiness, “Psychology and the Good Life”, shocked administrators: one in four undergrads (1,200 students) quickly signed up making it the most popular course in the Ivy League university’s 316-year history. Professor Laurie Santos explained that the things that ambitious undergrads associate with happiness – like academic and job success – actually do little to boost it, and this class teaches new habits like social connection and gratitude to create a radical change in a cutthroat university culture. A huge trend: new co-working, co-living and social wellness spaces/clubs hyper-focused on building strong “hang out” communities. The 12-story Assemblage in NYC, one of the new “third place” membership clubs, blends co-working space, daily events/workshops, mindful exercise, and an Ayurvedic restaurant, as they put it, “to transition from a society defined by separation into one of connectedness.” At the UK’s co-working and wellness space Mortimer House, each floor addresses one of Maslow’s (8) Hierarchy of Needs – from “love and belonging” to physical health. Co-working goliath WeWork is on a global expansion tear (now in 21 countries) with its work, wellness and community spaces designed for the gig economy, and are now launching other new community- and wellness-focused concepts, like WeLive (urban co-living residences rich in gathering places like pubs, cafes, fitness classes and open spaces.) and Rise by We (social fitness/wellness centers). See the “Feminist Wellness” trend for examples of new co-working and wellness clubs designed to give women places to network, make friends and empower each other…with much wellness on tap. For the new army of digital nomads that roam and work around the world, global networks of live-work communities like Roam are popping up fast, where building community on the road is the DNA: from social “family dinners,” to morning yoga classes on the lawn, communal kitchens, nightly beer gatherings, and where members get introduced to each other. 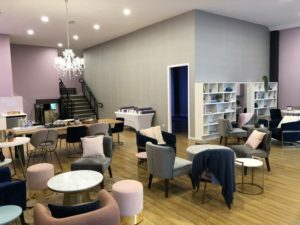 The affordable Club W concept just launched in Sydney, Australia is part teahouse and social club, part wellness education center, and part fitness/movement studio – for older Baby Boomer women who crave both community and wellness. It’s designed to be that place where they can just “be” and connect. The boutique fitness boom exploded in large part because it offers people an intimate, social “third place” beyond home and work: the “soul” is as important as the “cycle.” If the powerful community aspect of fitness studios has been implicit, now it gets more explicit with the rise of hybrid social and wellness clubs. For example, the new Club W concept just launched in Sydney, Australia, is part community teahouse, part social club, part wellness education center, and part fitness/movement studio – specifically designed for older Baby Boomer women who are lonely and crave community and conversation in a space where they can also immerse themselves in wellness. It combines virtual studios that serve up unintimidating and “smaller bite” virtual group exercise classes (from yoga to Pilates to meditation and cardio) and virtual education on everything from nutrition to relationships. But its goal is to be that place where women can just come and “be” and connect, a place to spend hours. And with a membership price-point under $20 a week, it’s one happy sign of more wellness for people beyond wealthy elites. The Global Wellness Institute’s new report Build Well to Live Well: Wellness Lifestyle Real Estate and Communities analyzes the fast-growing ($130 billion) global market for “well” homes and neighborhoods. A crucial aspect of these new developments is to reverse a decades-long “anti-social” trend in residential communities, which have actually been designed to create isolation and a lack of neighborly trust. Our car culture era, with a lack of sidewalks and attached garages that encourage people to immediately disappear into their homes without seeing any neighbors, has made for deeply anti-social housing. Our obesogenic built environments constantly reinforce an anti-social and sedentary lifestyle: favoring driving over biking, sitting over walking, riding in elevators over using the stairs, texting over face-to-face conversation with a neighbor, and watching screens over outdoor recreation. And they also increasingly segregate people by income and stage of life (urban millennials, people with kids, the elderly). In many of the new wellness communities the “community” is the very top priority, and they bake in neighborly collisions and connection with programming like education, arts and performance, and group community services – like Serenbe outside Atlanta, Georgia or Lake Nona in Orlando, Florida or South Village in Vermont. A key trend is bringing back multigenerational neighborhoods, because segregation is unhealthy and real-world (and not age-segregated) social connections are essential for people’s well-being. A few examples: The Interlace in Singapore integrates senior homes and assisted living with mixed-age/family-friendly neighborhoods…so all can “age in place.” At Humanitas in the Netherlands, college student housing is combined with senior residences. Some wellness communities are cultivated around shared culture or social networks. For example, the “Blue Zones” are communities identified around the world that exemplify the crucial habits, values and lifestyles that are proven to lead to a happy, long and healthy life. The beach cities of Southern California have secured over $8 million to create a “Blue Zone Project” that focuses not only on physical health, but heavily on community interaction, including workshops on living with purpose and social gatherings and classes (walking, fitness, mindfulness, etc.). We may have lost the kinds of neighborhoods that provided natural human connection and support, but now they’re being actively, creatively reimagined. A life that feels like a barrage of emails, texts and always-on work – endless “fake news” and divisive bot-generated social media insanity – the constant reminders that everyone else is succeeding and having a great time via social media – our faces glued to screens as we ignore the present world and the people we’re physically right next to…We don’t need all the new research to explain to us the toxic impact on our happiness and mental health that the digital world has unleashed. We have been unable to disconnect, but the tide is beginning to turn. As GWS keynote speaker and economist, Thierry Malleret, has argued, while people will not become rabid technophobes, 2018 is the year that they will begin to grasp how constant tech connection is making them unwell, unhappy and unproductive – and it will be the year that “reclaiming our peace of mind and focus will actually become cool.” And “cool” is no small thing when it comes to inciting behavior change. More restaurants, cafes, spas, gyms and stores are becoming digital-free zones. Governments in Asia have been first-movers in passing laws that block kids’ access to online games at night, called “Cinderella Laws” – with more or less success. Thailand was the first country (in 2003) to launch such a system (blocking online games from 10 PM-6AM) – but because gaming companies couldn’t make it work it had to repeal the law in 2005. In 2011 Vietnam blocked nighttime online game access. South Korea, which has the most tech addiction recovery centers in the world, passed its Cinderella Law in 2011, shutting down kids under 16’s online access between midnight and 6 AM. As a company, the Chinese Internet giant Tencent is the first to make a move: recently limiting under-18 user’s playing time for the world’s highest-grossing game, Honour of Kings. If you’re under 12 you get an hour a day, if you’re 12-18 you get two. Tech-Fighting Tech: That ironic paradox is neatly illustrated in the trend of a new wave of technology and apps helping us spend less time on our smartphones and screens. So many examples, and all with a different twist. The Moment app helps families manage their screen time, tracking both iPad and iPhone use and setting daily limits. The Off the Grid app goes further: you can block your phone for as long as you wish, and if you can’t resist the urge to check it before the unplugged session ends you get charged $1. Arianna Huffington’s company Thrive Global (in conjunction with Samsung) is rolling out a tech detox app called ThriveMode where you set healthy limits on email, texts and screen time and get cut off when you binge – and it blocks texts/calls from everyone except your VIPs while alerting people when you’re away from your phone. With smartphones/devices decimating the line between work and life and destroying vacations, the biggest trend in wellness travel is destinations that are off-the-grid or deep in nature but that also focus on meaningful human connection. We named “silence” a top wellness and travel trend in 2017, noting the rise of completely silent spas, silent meals at hotels/resorts, and totally silent retreats, to answer people’s desperate need to shut out the digital noise and get back to some thought and contemplation. There will be more travel offerings that are explicitly about cutting digital connections. Like at Mandarin Oriental spas, the first hotel chain to offer a Digital Wellness experience, with silenced phones and no electronic interruptions – even a silence ceremony at check in. Or the Time to Log Off Retreats held in places like rural Puglia, Italy, where every screen is switched off on arrival, and your time is spent doing yoga, meditation, cycling and walking on the beach (with a digital disconnection toolkit to take home). Or at Camp Grounded held in Mendocino, CA, a digital-free summer camp for adults, where happy childhood experiences like kickball, archery, and campfires with s’mores rush in to fill any digital addiction withdrawal. We’re even seeing new travel destinations explicitly designed around the science of happiness. Six Senses Bhutan opening this May will be the first wellness “circuit” where guests will travel across five lodges – and at each one they will be totally immersed in one of five key pillars of Bhutan’s “Gross National Happiness Index” – whether mental well-being or culture. Ireland’s Boogie Bounce is a high energy, low impact program that provides exercise and fun. Shown in photo: Founder Jenny Belcher and her two daughters. playfulness or just exercising like you did in your high school gym. As the New York Times recently noted, more people are abandoning the pricey spinning classes and taking up simpler and old-school exercise that came so naturally in school – whether basketball camps or swimming at the Y or tennis in a public park or just dancing. You know, fun sports that don’t feel forced, rather than pretentious “fitness concepts.” Like NYC’s Lady Ballerz where women get together to shoot hoops and have a clinic on some basic, high-cardio basketball skills. 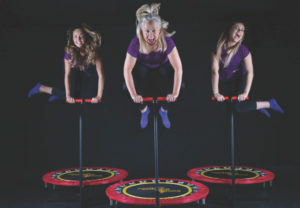 The hot new trend of trampoline fitness returns people to that backyard birthday party – like Ireland’s Boogie Bounce or Hong Kong’s BounceLimit classes, that usually take place in a music-filled party atmosphere and work every muscle in the entire body. No fuss, just fun. GWS keynote speakers, Thierry and Mary Anne Malleret, argued for a return to radical simplicity in exercise in their talk (based on their new book) Ten Good Reasons to Go for a Walk, which presented the powerful medical evidence for that the most deeply human of all movement, walking – which we’re hard-wired to do without thinking, which dramatically improves the health of our brains and bodies, and that’s a natural meditative and creativity-boosting activity. Walking and hiking in nature are having a major resurgence – even as the new way to conduct that company meeting in Silicon Valley. Meditation and mindfulness have of course become a huge global trend as they deliver a powerful path to happiness and contentment and are a critical skill needed to survive an info-overloaded digital world. Many studies show mind wandering is associated with unhappiness, while meditation, which involves being immersed in the present moment while observing in a nonjudgmental way, counterbalances it. The Berkeley Science Review explains that the mindfulness-happiness connection is based on the fact that a discrepancy gap often exists between our actual and ideal self, and mindfulness meditation helps close it. And now meditation is becoming dramatically more accessible (more on the model of the corner fitness studio) like NYC’s drop-in meditation center MNDFL or LA’s The Den. Other happiness approaches on the rise in the wellness world: more Laughter Yoga (which marries the breathing techniques of yoga with prolonged voluntary laughter, and makes you happy whether you think something is funny or not)…and “smile” asana. In 2018 we’ll see more “eating for happiness” with diets and menus packed with more foods like tuna, salmon, nuts, seeds, bananas, green tea, dark chocolate, spinach, blueberries and blackberries, because they boost serotonin and other happiness hormones. Research mounts that food has a powerful impact on the brain and mood: for instance, a 2017 study from Deakin University (AU) showed that an anti-inflammatory Mediterranean-style diet high in vegetables, fish, olive oil and nuts reduced symptoms of depression in 32% of its sample. J. Walter Thompson (JWT) also named “Mood Food” as one its top trends for 2018, and we see companies like Monarch Airlines creating mood-enhancing food menus for passengers (like green tea and lavender cakes to calm anxiety) or even Pizza Hut introducing a mood-enhancing pizza. The really eye-opening research is around how our microbiome – that ecosystem of bacteria, fungi, viruses and yeasts that live in our intestinal tract – plays a powerful role in regulating our emotions and determining our very happiness. All those bugs in our gut generate many of the transmitters and hormones that play out within the brain, like serotonin that regulates mood, appetite, sleep and social behavior. Studies even indicate that the lion’s share of our serotonin is produced in our gut, and disruptions in the microbiome are being connected to anxiety, depression, autism and dementia. The research about the tight connections between the gut and mental health is so compelling that the Denver VA hospital is running a trial using probiotics to treat veterans with PTSD, and their findings about the impact that this simple food supplement has on how our brains and bodies respond to trauma are fascinating. It’s no newsflash that more people are eating for a healthier microbiome, meaning more soluble fiber (like brown bread, nuts and seeds) and probiotic/fermented foods like yogurt, kombucha, kefir, sauerkraut and kimchi. What we will see more of is research specifically on the gut-brain-happiness axis, an exciting field called psychobiotics. Economists agree that in so many ways we’ve never had it better. Much of the world has an abundance of food – income-per-capita is up – as is life expectancy. Yet overall the world is unhappy – and even in very wealthy countries like the U.S. or UK, depression, anxiety, addiction and suicide rates are rising. The happiness science points to reasons why. Of course a key happiness measure like income is a factor (and the extraordinary problem of rising global income inequality – after all, happiness is about perception and expectation), as is declining trust in government and business, and lack of access to good and affordable healthcare. It goes without saying that governments and societies that care about the happiness of their citizens need to do more on these fronts. But as we’ve hammered home, it is somewhat more intangible aspects like human connection, strong community and having a life purpose which have such an outsized impact on happiness. And while the annual happiness reports don’t measure the impact of technology usage, the early evidence that constant connection to digital/social media is taking its toll on our mental health is too alarming to be ignored. 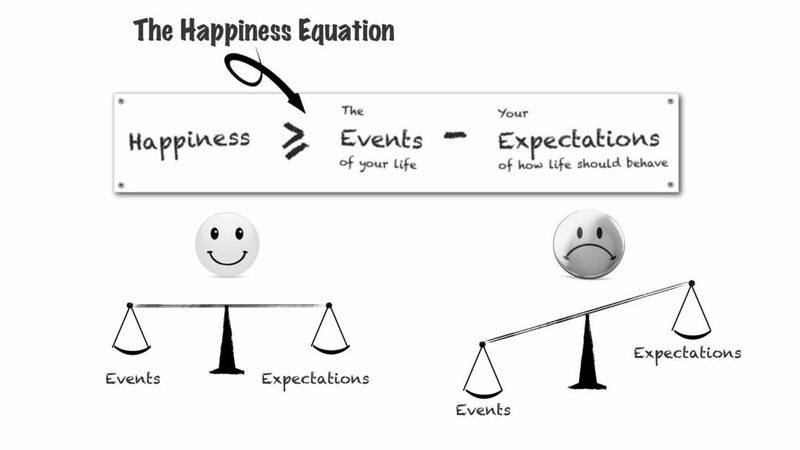 And this new “unhappiness science” we feel needs to be figured in to any happiness equation or solution. These two bodies of research point to two things the wellness world needs to focus on more strongly in 2018 and beyond: more models that drive social connection and more that make tech disconnection possible – and to make both a life philosophy. The world – and the wellness world – needs to study the happiest nations: not only what they do at a government/policy level but what they do at a cultural level – what is their culture of happiness and wellness? In the future we predict the study of this will go even further than the happiness reports that gauge a handful of measures. And it’s fascinating that in the wellness world in the last two years that there has been an explosion of grassroots “wellness trends” around the happy nations of Northern Europe’s unique happiness philosophies. The Danish concept of hygge, creating cozy environments or nests for close connection (or that feeling of “just right” coziness), has become a global phenomenon since 2016 – with dozens of books published on the hygge philosophy in the U.S. alone, including bestseller The Little Book of Hygge: Danish Secrets to Happy Living. There has been buzz over “lagom,” the Swedish concept of “not too much, not too little”, or their ethos of moderation – and also for the Japanese philosophy of “Ikigai,” or finding a true life purpose – focusing on what you love, what you’re good at, and what the world most needs from you. People simply can’t get enough of wellness trends from happy and long-life nations: whether the Swedish concept of “fika,” which is literally taking a social coffee break, but really just means putting down that phone and chatting and appreciating the moment with whoever you’re with – or the Norwegian philosophy of Friluftsliv, or “free air life,” which is embracing the life outdoors and the fact that experiences in nature are a homecoming – or the Swedish practice of “plogging,” or picking up litter on your walk or run, so adding some environmental purpose to your fitness. It’s as if people all over the world were intuitively seeking happiness philosophies from the happiest nations. And it illustrates an important shift happening in wellness: from products and treatments and therapies to a thirst for philosophies or life practices that will make you happier and healthier – a hunger for cultural knowledge rather than commercialized wellness. (Notably, these wellness practices are near free.) As economist Thierry Malleret has argued, people (and we would add, too many wellness businesses/approaches) confuse pleasure or short-term reward with happiness, putting too much emphasis on hedonic well-being (pleasure) instead of eudaimonic well-being, which is about contentment, a sense of purpose, and self-realization. (The concepts are from Aristotle.) A relentless quest for wellness, happiness and self-optimization, what The New Yorker has just called our era of “improving ourselves to death,” is hardly a path to happiness – it’s an ego-driven pressure. And in the future, the eudaimonic concept of well-being will become more important: less focus on self, and more focus on others and community. We need to fight the fact that our brains now produce too much dopamine – the “reward” neurotransmitter that leads us to want more instant/self gratification, whether via sugar or social media – and produce more serotonin, the neurotransmitter for “contentment,” which dopamine drives down. “2018 Wellness Trends, from Global Wellness Summit”.